I have asked God for many things in prayer, but none more frequently or fervently than I have asked Him for wisdom. Wisdom is the ability to apply truth to a situation. 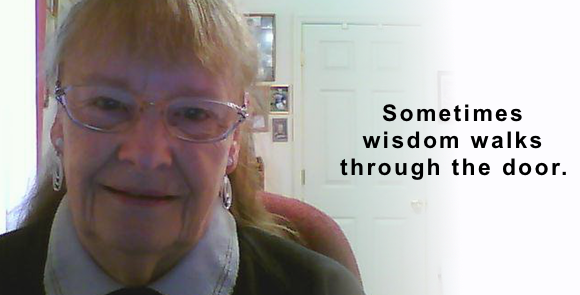 Wisdom helps you discern the variables and make the best choice. Wisdom is a telescope on consequences. The ways God has answered my request for wisdom have been various. Sometimes it has come with insight, sometimes through careful study. There are many times in which I can honestly say that even though I was the one speaking, wisdom has come in such an unusual way that it was almost as if I were a spectator to my own words. It was as if I were hearing things come out of my mouth that did not originate in my thoughts. Most of the time that sort of thing will get you into trouble. With wisdom it borders on miraculous. Sometimes wisdom walks through the door. Her name was Betty. At the time I was about 25 and 2 years into pastoring a church that was beginning to show signs of growth. At the same time I was too proud to admit and too naive to know that I was in over my head. There was no way we would accomplish what was about to come without some real guidance. Our part-time secretary had just resigned to take another job. Enter Betty – walking wisdom for the proud and naive. I was working on my mid-twenties. Betty was working on her mid-sixties. We didn’t hire a secretary. We hired my nanny. Betty had served as the church secretary of a small Nazarene congregation for several years. I am not up on Nazarene church polity, but as Betty explained it, when the pastor was out, the chain of command eventually made its way to the church secretary. If there was no one else to take the reigns, the secretary would perform all pastoral duties including filling the pulpit. I can’t remember exactly how she explained it, but for quite some time there was no pastor for their church; so there was Betty. This essentially meant that I had just hired a secretary that had more pastoral experience than me. Betty had also worked for a highly successful business man. She would tell me often, “I made him a millionaire, God sent me here to make a great man out of you.” I believed her. When she called me “Now” that meant it was time to sit and listen to wisdom. Dejected, discouraged, enraged, or confused; Betty always knew the words to say that helped me think before I made a big mistake. She never made demands on any action I had to take; but with her words she constrained me to Christ in every thought. In a lot of ways, she saved me. Rooted in the Nazarene tradition she valued holiness. It was her sincere goal to be perfect for Christ. If I have ever known a Puritan in the modern era, it was probably Betty. She had an immense knowledge of the Word of God. She spent hours with the Lord everyday. She would never hesitate to tell you, not what she would want in a situation, but what the Lord would want. There was never a doubt in my mind, Betty knew the Lord. Watching her relationship with Christ makes it more ironic that I baptized her. Coming from the Nazarene church she had never been baptized by immersion. When she and her husband Paul joined our church, without hesitation they gave themselves to baptism by immersion. The day I baptized her I felt like John the Baptist baptizing Jesus; unworthy. I may have immersed her in water, but for the next 3 or 4 years Betty immersed me in prayer, discipleship, and a relationship with Christ that inspired my life. As a pastor it is easy to get so busy, so overloaded, so constrained for time that you become burdened by the task rather than burdened for the Lord. Betty helped me to find wisdom in the way I work. She helped me to understand that my work for the Lord was born from my walk with the Lord. She came to the office everyday with the fresh fruit of her time spent with God. I am deeply grateful for her example to me in this. Even though it was her title, I never thought of Betty as the church secretary. She was a competent counselor. She was a tenacious prayer warrior. She was a grand theologian. She was a capable teacher. She was a tireless worker. She was a vanguard for me, a watchman who could warn and protect me from trouble long before it arrived. There are so many situations Betty helped steer me through that could have been otherwise disastrous. And these are the things I saw her do. There is probably a volume to be written of things she did for me and for others of which we will never know. The season Betty and I served together at Lantana Road Baptist Church was a time of exponential growth. I can say without hesitation, that I believe one of the reasons God blessed the church as He did was because of His servant Betty. He blessed her and we benefited because of it. Last week Betty passed away suddenly. The moment I heard she had passed I knew I had lost one of my greatest prayer warriors. I know without fail that Betty never stopped praying for me. I also know, that even though I am now 41 and 13 yeas removed from my pastorate at Lantana Road, that she continued to take responsibility for me until her final day. Despite the fact I had left her more than a decade before, I know Betty never left me. She kept me before the Lord. Sometimes wisdom enters the mind. Sometimes it walks through the door. Posted in Church Appreciation, Things God Teaches You Because You're Alive.